Graham Staplehurst’s Robin Hood: The Role Playing Campaign (ICE, 1987) is a true gem among RPG sourcebooks. As a sourcebook for historical roleplaying, it has only once been equalled (by Columbia Games’ Lionheart) and never been bettered. However, it must be said that its title is misleading. 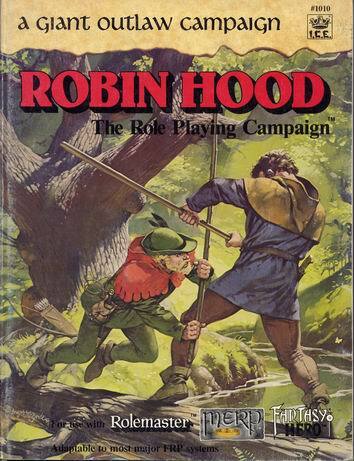 This book has not one, but two campaign settings, and one of them — arguably the more interesting one — has nothing to do with Robin Hood at all. At the time this book was published, Staplehurst had gained a considerable amount of respect among British RPGers for his classy articles and scenarios for MERP in the White Dwarf magazine (these were the days before it became Games Workshop’s house mag). Knowing his output, and being a fan of the Robin of Sherwood TV series, I bought my copy of Robin Hood without hesitation as soon as I saw it in my game shop. It exceeded my expectations in every way. Sixteen years on, it remains one of my all-time favourite supplements. Why so? Well, it isn’t only that Staplehurst is a superb writer, but also that he delved deeply into English history, myth and folklore to produce something that really does have the full flavour of medieval England. It helped that, as a Brit, he also had a good knowledge of the areas he was writing about. And despite his reseach, Staplehurst never loses sight of the the fact that he is writing a sourcebook for a roleplaying campaign, not a history book. Everything in the book is aimed at helping the GM get the right atmosphere for the campaign(s), and passing that atmosphere on to the players. And it manages to do it without assuming the readers have any knowledge of the historical period. Everything you need is in the book. The book begins with a two-page introduction, laying out the basic ground rules of roleplaying, and the premise of the campaign: that the players will be bold outlaws fighting an oppressive Norman regime, that they will become the people’s champions, and that they will probably all die in one last, glorious battle. There follows a 12-page section on designing characters fro the three supported rules sets (pre-RMSS Rolemaster, MERP, and the first edition of Fantasy Hero). As befits a book by a MERP guru, the MERP rules are probably most effective, and are heavily modified from the basic rules. The Fantasy Hero rules, however, are the only ones that are really still current, for even with the Hero 5th rules, the basics of the system remain the same. The weak area of character generation is in the magic rules — there are some vague hints about the “powers of light and darkness” (pure Robin of Sherwood), and some suggestions about herbalism and prophecy, but nothing concrete. There are some sample character backgrounds, some drawn from history or legend (Hereward the Wake, Robin of Loxley, Eustace the Monk), others fictitious. Then comes six pages of history, from the Norman Conquest in 1066 to the end of the King John’s reign in 1216, including a fairly detailed timeline, before we get to the real meat of the book. This begins with a 30-page overview of life in Norman England, discussing government, arms and armour, languages (with examples given of Norman French, Old English, Welsh, Gaelic, Norse and others), religion, society, wild animals, folklore (which draws upon geniune medieval folktales), herbalism, and a geographical overview of England, broken down into regions. Another 30 pages on running an outlaw/medieval campaign contains some of the most useful gaming ideas I’ve seen. 12 sample encounters, each with several variations on the main theme, are ready-made to provide red herrings or sub-plots in a game; there’s a quick but effective way of tracking the outlaws’ reputations with both the common people and the authorities and a selection of standard NPCs the outlaws are likely to encounter (townsmen, peasants, priests, nobles, foresters and more). Finally, there are sample castles and monasteries, with floorplans and descriptions. Then come the two suggested campaigns. Both follow the same pattern — a timeline of local events, a map and gazeteer of the area (based on Domesday), NPCs and five adventures. The obvious one — Robin Hood — is set in Nottinghamshire in reign of Richard the Lionheart, and allows players either to play their own characters, or take on the role of Robin and the Merry Men. 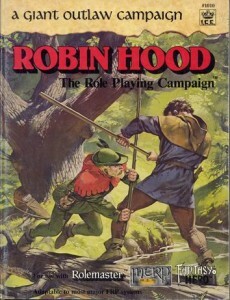 The mood of the campaign is heavily influenced by the Robin of Sherwood TV series. There may be no Herne the Hunter, but the Green Man watches over the outlaws, for instance. The other campaign is set in the Forest of Dean during the reign of King Stephen (also known as the Anarchy, and probably best known to general readers as the period in which the Brother Cadfael novels are set). Here the Normans aren’t only oppressing the English, but the Welsh as well — and each other, for this is a time of civil war. In this campaign, the players will meet embattled noblemen, a Welsh wizard and one of the greatest relics in all Christendom. Aside from the colour cover by Angus McBride, illustrations (mostly by Denis Loubet) and maps are in black and white. Maps are, frankly, poor, which is a real pity — I’d have loved colour pull-out maps by Pete Fenlon, as ICE did for their Middle Earth supplements. But in the face of such a monumental work, that’s a minor quibble, and can easily be remedied by acquiring a copy of Lionheart, that other great historical RPG sourcebook by Columbia Games, which does have a colour map. In fact, as I noted in my review of Lionheart, the two books complement each other very well: Lionheart stresses accuracy over mood, and Robin Hood mood over accuracy. Lionheart concentrates on political history, Robin Hood on social history and legends. There are deliberate fabrications in Robin Hood, mostly intended to increase the atmosphere, but you won’t spot all of them that easily — my favourite example is the borders and administrative divisions given for Sherwood, which are fictitious. To figure that one out took me months of research, and finding the real borders required me to learn the basics of medieval Latin. This entry was posted in Gaming, History and tagged Hero System, MERP, review, Robin Hood, Rolemaster. Bookmark the permalink.